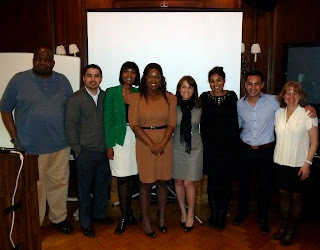 On May 2, 2012, six students from Ackerman Institute’s Social Work and Diversity Program each presented a moving description of their clinical experience in the program to a large audience of Ackerman faculty, students, and friends. This annual presentation from students is not an only an opportunity for them to summarize the family therapy work done at Ackerman, but also a celebration of the completion of their year-long internship. The goal of the Social Work and Diversity Program is to increase the number of professionals of color in the family therapy profession who will be able to provide culturally relevant services to the increasingly diverse communities of New York. Despite the growing number of minority families in the United States, only 4% of family therapists are from minority backgrounds. The interns in the program are second year graduate students from the social work schools at Hunter College, Columbia University, and New York University. During their one-year at Ackerman, students take part in live supervision and family treatment, foundational classes in family therapy, and community outreach, where they integrate their training into an outside organization. The six students in this year’s class included: Candice Diaz, Paula McCoy, Salvatore Giametti, Reka Prasad, Miguel Torres, and Jasmine Butler. Each presented on their clinical work, while also expressing the life-altering nature of the program. Reka talked about her experience counseling a recently separated couple, Miguel and Jasmine spoke about therapy with a broken family of mixed heritage trying to mend their relationships, Paula discussed her involvement in group therapy with high school students, and Salvatore and Candice described therapy sessions with a family of Ecuadoran women. The Social Work and Diversity Program is made possible by private support from individuals and family foundations.